In March 2017, the International Electrotechnical Commission (IEC) published a new product standard for variable speed drives: IEC 61800-9: Ecodesign for power drive systems, motor starters, power electronics and their driven applications. This new standard deals with the energy efficiency of AC drives and drive-motor systems. IEC 61800-9 (part 1 and 2) is heavily based on the European Standard EN 50598 (part 1 and 2) which has been in effect since 2014. It is expected that the IEC standard will be harmonized in Europe as EN 61800-9 and will replace EN 50598. The differences between the two standards are minor and consist mainly of adjustments that cover the different grid voltages and frequencies (50 Hz/60 Hz) around the world. The extended product approach is a key concept enabling energy optimization at system level. It combines the efficiency (or losses – just another way of expressing it) of the motor system with the efficiency of the driven equipment. Let’s look at a practical example involving a water pump driven by a motor which is fed by an AC drive. To translate this into the language of IEC 61800-9, the pump is the driven equipment, the motor and drive together are the power-drive system, and the drive is called the complete drive module (CDM). The extended product approach allows us to determine the efficiency of the drive + motor + pump system (colloquially referred to as wire to water efficiency) by combining the efficiency of the drive, motor and pump. But a pump system does not run all the time at full load. The efficiency of the system can be also determined in part load conditions – therefore we need to know the part-load efficiency of the three elements: pump, motor and drive. Knowing the load-time profile of the application enables us to sum up the efficiencies in the various operating points and calculate the Energy Efficiency Index – EEI of the system. To summarize, the Energy Efficiency Index is an indicator of the efficiency of a complete system, under defined load-time profile. It allows us to compare systems and to perform optimization at system level, by selecting the most efficient drive – motor – driven equipment combination. IEC 61800-9 defines efficiency classes for AC drives and motor-drive systems (called Power Drive Systems or PDS in the standard). For AC drives, the standard defines three classes: IE0, IE1 and IE2. A reference value is defined for each power size. The reference value corresponds to IE1. If the drive has 25% more losses than the reference value, it will be categorized as IE0. If it has at least 25% less losses than the reference, it will become IE2. The IE class for AC drives is determined in a single operation point at 100% current and 90% output frequency. All Danfoss drives (both VLT® and VACON® brands) are IE2 class. For motor-drive systems, there are again three classes: IES0, IES1 and IES2. The ‘S’ after ‘IE’ stands for ‘system’. IES1 is the reference class. Unlike drives, for systems the ‘width’ of the classes is +/- 20%. That means that if the losses are up to 20% lower than the reference value, the class becomes IES2. The IES class is determined at nominal load and nominal speed (100% / 100%). It is possible to determine the IES class for a combination of AC drives from one manufacturer with motors from another manufacturer. Direct ‘addition’ of classes is not possible, that means it is not possible to determine the IES class of the system by knowing the IE class of the motor and the IE class of the drive. 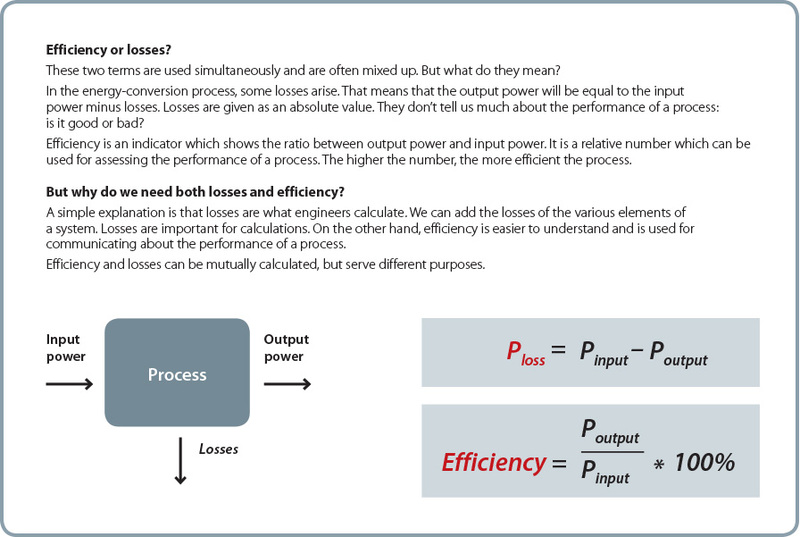 A simple calculation is needed: the losses of the motor have to be added with the losses of the drive and the sum compared with the reference value. In order to simplify the combination of Danfoss drives with any induction motor, Danfoss has developed a calculation tool that does the maths for you, and even generates a certificate. 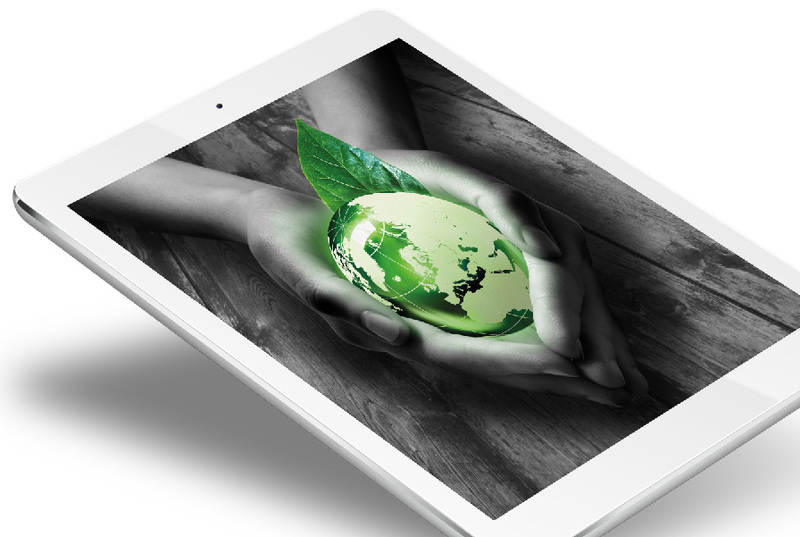 The tool is called Danfoss ecoSmart and is accessible on the web at ecoSmart.danfoss.com or as an app from the Apple Store and Google Play. 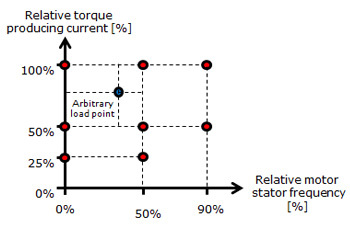 IEC 61800-9 defines some standardized points where the partial-load efficiency of AC drives and motor-drive systems needs to be determined and published by manufacturers. Based on this information, users can determine the efficiency of the drive or motor-drive system in any operating point, by interpolating between the standardized points. This information can be later used for determining the energy-efficiency index. For AC drives, there are eight defined operating points, as shown in the figure below. 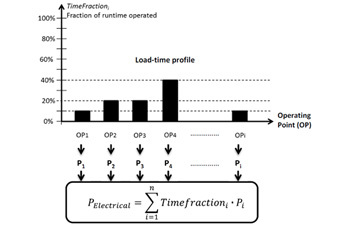 The illustration also shows how the efficiency/losses in an arbitrary load point can be determined by interpolation. The Danfoss ecoSmart tool helps users determine the efficiency in partial-load operating points. 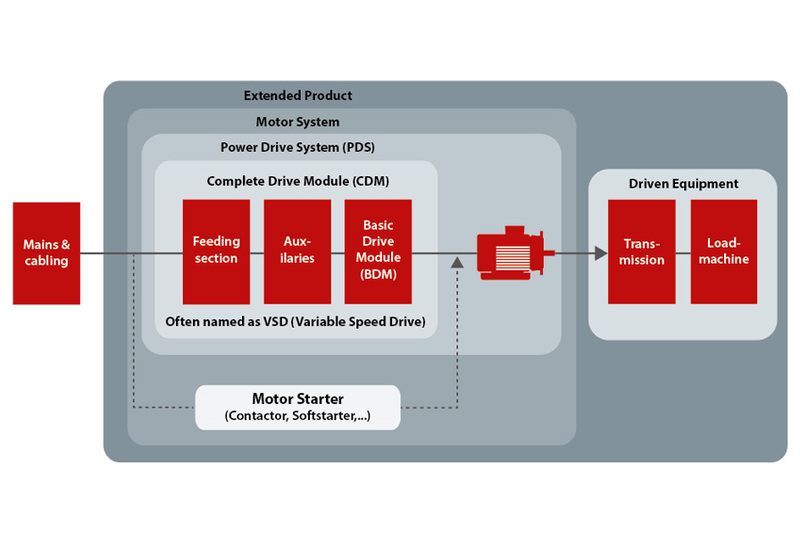 Danfoss ecoSmart can also be used to find the part-load efficiency in the standardized points for any Danfoss VLT® or VACON® drive from the current product families. For motor-drive systems there are also eight defined operating points, as shown below. It can be observed that there is a slight difference from the drive operation points: for motor-drive systems, the two points at the right are defined at 100% speed and 50/100% load. For drives, the two points at the right are the 90% stator frequency and 50/100% load. The new IEC 61800-9 standard will increase the focus on the energy efficiency of AC drives and motor-drive systems at an international level. It defines energy-efficiency classes for drives and motor-drive systems. It also defines standardized part-load operation points where manufacturers need to publish the efficiency of their products. Danfoss has a strong tradition in dealing with energy efficiency and sees the new standard as an opportunity to increase the focus on this topic. 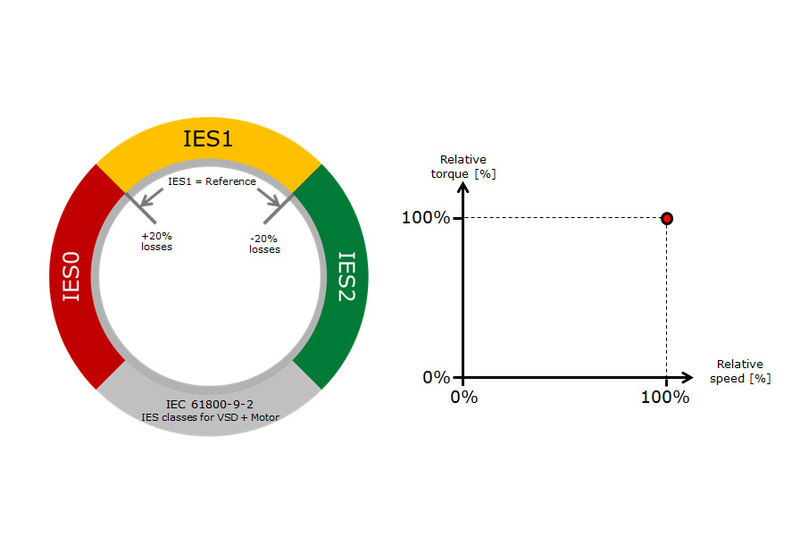 Our supporting tool – Danfoss ecoSmart – allows users to determine the IE class of drives, IES class of motor-drive systems and also the part-load efficiency of a drive. You can read more about energy efficiency on our website. And if you would like further information, don’t hesitate to leave a comment in the box below. We’re here to help. Hi, really good text. I would like also favour losses over efficiency. Losses are anyway power which has to be produced by power plants. So there is direct cost involved. But then we could also use term “heat losses” because the losses of drives and motors will produce heat, usually into air or with liquid cooled units into circulating water. In some cases this dry warm air can be consumed to something useful. Then it is not even losses. You are right, especially high power drive have a great advantage, due to their design. In small drives the picture gets a bit more complicated, and you can no longer focus only on efficiency. A simple drive such as the VLT FC-51 Microdrive or VACON 20 have less losses than an equivalent size VLT FC-302 or VACON NXP. In such a case parameters such as control performance or enclosure IP become more important than efficiency. thank you for th good summary and quick reference to the differences of IEC/EN versions. Especially the topic on “losses” and efficiency! I strongly vote 8always!9 to look into the real Watt losses, not in relative figures. 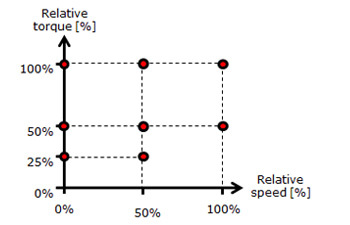 In the majority of cases, we look much better than competetive products with surprisingly same relative “efficiencies”. It must be part of the Value Propositions and will increase in its importance to share. With the correct losses, it is much easier to consider advantages (e.g. using our duct kit cooling system), worth in lower investments on recooling systems, but also on TCO while lower energy costs and less maintenance on recooling units. It appears so attractive.